There are many of explanations for this mismatch. What it usually boils down to is a decade of exceptionally high levels of monetary stimulus (low interest rates) feeding into the US equity markets. But after nearly tripling in value over the period of a decade, the following big question arises: How much longer can the party continue? During the past decade, the US has more than doubled its amount of US Federal Debt. There is a big debate about this on the market, but unless you believe that the US economy is indeed unstoppable, you may want to tread carefully and look for some alternative fundamental value. So, who has been investing in emerging and frontier markets? The thing is that the first chart somehow distorts reality. The ‘leveraged’ returns of the US market make the emerging and frontier markets look weak from a relative standpoint. At it’s highpoint at the end of 2018, the S&P500 has nearly quadrupled in value from its lows in 2008. But what we can see is that in emerging markets, there is genuine economic growth and a reasonable equity market performance to go with it. 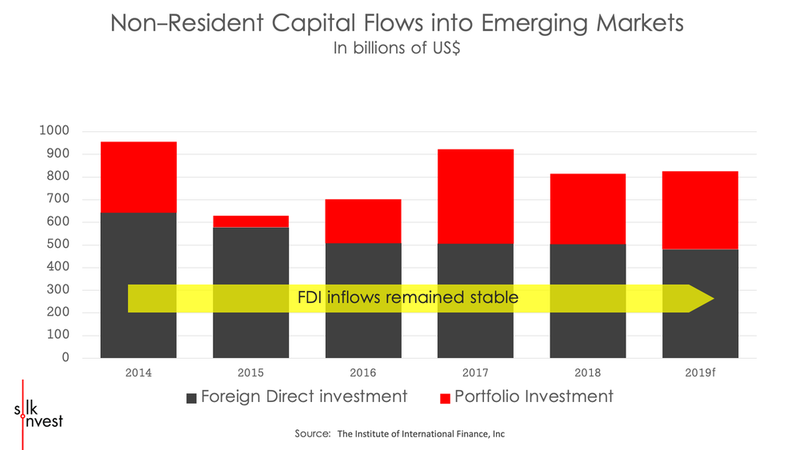 The above chart is showing us that foreign direct investment (FDI) levels have been quite stable over the past 5 years. The ‘smart strategic capital’ is already quite active in these markets. This is of interest because FDI investments typically have a few years lag-time before they start having an impact on their target economy. When it comes to ‘non-resident portfolio flows’, there has been a recovery since 2015, and because it mostly took on the shape of debt, equity markets haven’t registered the impact of inflows in an equal way. The key question is: will equity flows broaden its share of foreign portfolio flows? Another good question to ask may be: how much longer can investors ignore the worlds fastest growing economies?